Samsung is mounting a serious challenge to Sonos in the multi-room audio market. Samsung’s Shape product line includes the M7 Wireless Audio Speaker reviewed here; a pair of smaller siblings, the Shape M5 and M3; several Wireless Audio Soundbars; and a Link Mate box that lets you add non-networked audio gear to its system. 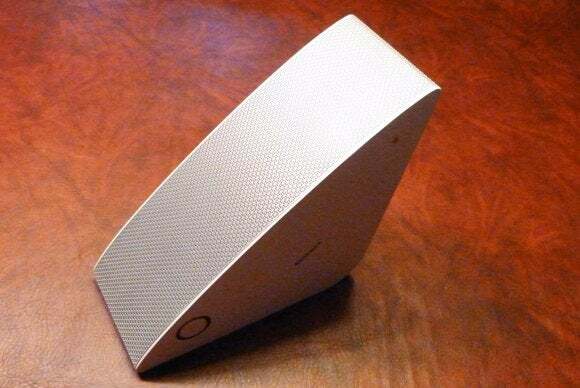 As with Sonos’ numerous self-powered speakers, you can deploy a single Shape speaker and control it with your smartphone over your home network. But the real fun starts when you deploy Shapespeakers all over the house. Samsung’s solution isn’t as elegant as the Sonos mesh network, and Samsung doesn’t support nearly as many online music services, but the M7 speaker sounds pretty good. Samsung sent two M7s and an HW-H750 sound bar so I could evaluate the individual speakers as well as the product’s multi-room chops. This review focuses on the M7 and my installation experience with the system as a whole. I’ll review the HW-H750 later. 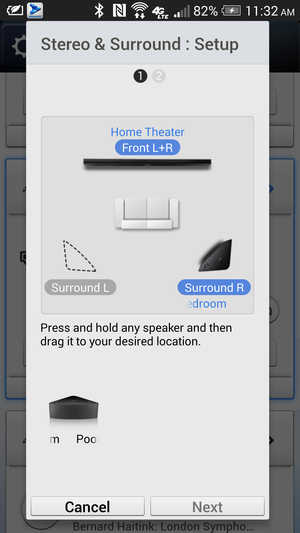 Samsung’s “optional” hub is actually a requirement if you want to set up a multi-room system using its Shape-series speakers. You’ll need Samsung’s dual-band (2.4-/5GHz) WAM250 hub if you want to set up a multi-room audio system, using whatever combination of Shape speakers and wireless sound bars you decide to deploy. 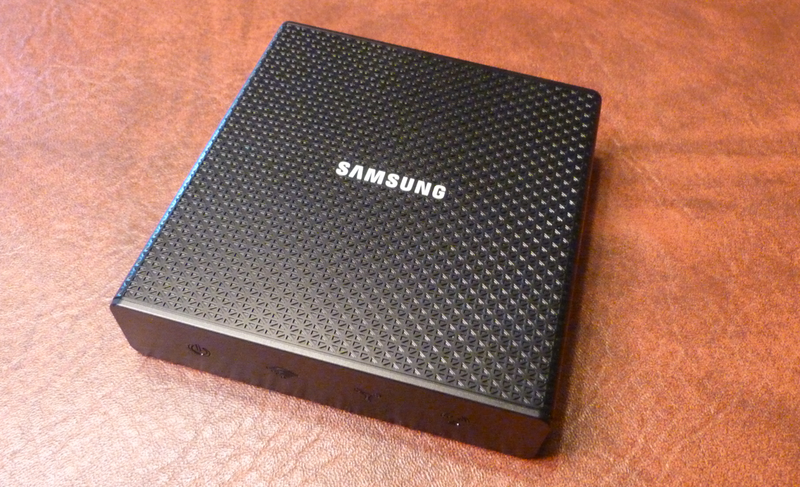 This little box plugs into your Wi-Fi router and enables Samsung’s smartphone app to see all the speakers. Its wall wart is way out of proportion to the box’s size, but Samsung thoughtfully provides a two-port ethernet switch inside of it so you won’t lose any hardwired ports on your router. Installing the system isn’t at all complicated, but it can take a long time. After you fire up the hub, you plug in the speaker. It emits some tones to let you know it’s starting up, and a blue light on its front panel starts blinking. The light glows solid blue once the speaker has connected with the hub, but this was taking much too long. I was sure I’d done something wrong. Each speaker can run independently or be grouped together to play the same tracks. A quick peek at the user manual yielded this surprising tidbit: It can take the hub up to 20 minutes to connect to your network, and it can take the speaker up to 10 minutes to connect to the hub. I didn’t time how long my setup took, but it seemed like an eternity. Enduring the wait isn’t the worst part: The speaker emits an incessant beep that sounds exactly like water falling from your home’s roof gutter to the bottom of its downspout. It’s torture. But once you’ve configured the hub and one speaker, adding additional speakers is practically automatic. 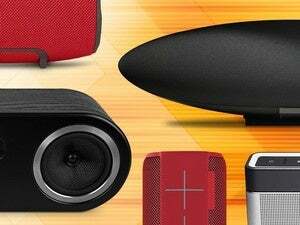 Pair the speaker and your smartphone using Bluetooth, and you can control the speakers using the free Samsung Multiroom app (available for Android and iOS phones).The pairing process is rendered particularly easy with an Android phone, because there’s an NFC chip embedded in the speaker. Just tap your phone on top of the speaker and you’re ready to go. Setting up an iPhone requires a few additional steps. There are a few other controls atop the M7, too, including a touch-sensitive volume-control ring, a mute function, and a button for changing Internet radio stations. You can cycle between three of your favorite stations by tapping this button. The hub comes with a two-port ethernet switch, but its USB port is strictly for firmware updates. You can plug a thumb drive and play music from it. The rear panel of the speaker has an ethernet port, a 1/8-inch auxiliary analog audio input, a WPS button for Wi-Fi setup, and a button for pairing additional speakers. Samsung offers an optional wall mount for the speakers, but I’d be leery of mounting these 8.4-pound boxes to drywall unless you’re anchoring them to studs. The M7 is a beefy speaker, bigger in size and power than anything Sonos has to offer (apart from the Sonos Playbar and Sonos Sub, that is). The M7 cabinet houses one 4-inch woofer, two 2.2-inch mid-range drivers, and two 0.74-inch tweeters. A single M7 operates in stereo when laid flat, but it has a large footprint at 15.8 inches wide. You can orient it vertically using the provided stand. If you have a pair of M7s, you can configure them as a left/right stereo pair. If you have the sound bar and a pair of M7s, you can configure the M7s as left/right surround channels. You can do the same if you own a Samsung TV with Samsung’s SoundConnect technology. An EQ setting lets you make bass, treble, and balance (left/right) adjustments. Samsung’s app looks attractive and is fairly easy to use. You can control each speaker separately and have each play its own music from any source (devices connected to the speaker’s aux port, servers on your Wi-Fi network or, using Bluetooth, tracks stored on your smartphone). Or you can create groups of two or more speakers and have them play the same music. The network did a great job of keeping the three speakers (plus the sound bar’s wireless subwoofer) in sync, but there’s a momentary dropout when you group or ungroup speakers. And you can’t add speakers to an existing group; you must ungroup them and then create a new group. The Shape M7’s wedge shape reminds me of an old Klipsch horn tweeter. The app presents your music library ordered by songs, albums, artists, and genres, but there’s no mechanism for speed-navigating a large collection of music. I have more than 10,000 tracks in my library (stored on a WD Mirror NAS box), so finding specific tracks was an exceedingly tedious task. You can create playlists using the tracks stored on your phone, and you can call up playlists stored on a server, but you can’t create them based on tracks in your now-playing queue (nor can you edit your queue to move tracks up or down the order). You can set an alarm clock with day and time settings, but you’re limited to choosing stations from TuneIn Radio. You can set a volume preset, so you don’t need to remember to change the volume of the speaker—in case you were blasting it the night before and don’t want to be startled in the morning (or maybe you do). The speakers have a sleep timer function, too, which will automatically turn the speaker off after a specified number of minutes have passed. 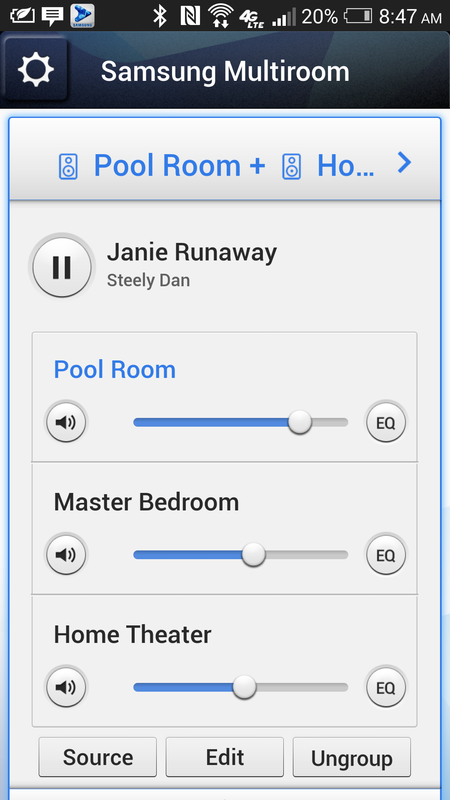 As mentioned earlier, the Samsung Multiroom app lets you play Internet radio via your choice of iHeartRadio and TuneIn. You’ll also find support for a variety of other online music services, including Samsung’s own Milk (curated by Slacker, one of my personal favorite services), as well as 8Tracks, Pandora, Rdio, Rhapsody, and Spotify. Samsung also supports Amazon Cloud Player and Murfie, two services that let you stream your own music collections from the cloud. This pales in comparison to Sonos’ offerings, which include all of those services plus Beats Music, Deezer, Google Play Music, Last.FM, Songza, and many more. Samsung declined to release much information about the M7’s specs beyond what’s published on its website, so I can’t report what type of amp they’re using, how many watts it produces, or what type of materials the drivers are fabricated from. Based on my listening tests, I’d say the W7 is a relatively well-balanced powered speaker, as long as you don’t push it too hard. Some speakers have difficulty with the dynamic range of classical music, but the M7 handled the quieter passages in the London Symphony Orchestra’s recording of Brahms’ Symphony No. 3 with aplomb, fully realizing the bass strings without need to pump the volume to levels that would distort the oboe, flute, and violins. The M7 performed well with rock and jazz tracks, too. I listened to everything from Steely Dan to Dave Brubeck, The Blind Boys of Alabama, and Alison Krauss. All the tracks I listened to were encoded either as 16-bit/44.1kHz FLAC or as Apple Lossless files. You can also set the speakers up as stereo pairs or as surround speakers for a home theater installation. Samsung bundles a wireless subwoofer with its HW-H750 soundbar, but it doesn’t offer the sub separately. And the M7 really doesn’t need the additional low end—it delivers plenty of bass on its own. Put the M7’s back against the wall, however, and the woofer will turn flatulent and higher frequencies will get ugly. I also detected unpleasant vibration and resonance from its plastic enclosure when I cranked up the volume. Fortunately, you don’t need to twist the dial far to fill up a good-sized room with sound. One of the features I like about the Sonos ecosystem is that you can buy modules that don’t have any speakers, so you can supply your own active or passive models. And you can supplement them with a beefy subwoofer. Samsung doesn’t offer either option, but it’s probably targeting a wider audience with its product (then again, a $500 speaker doesn’t exactly scream “mainstream”). 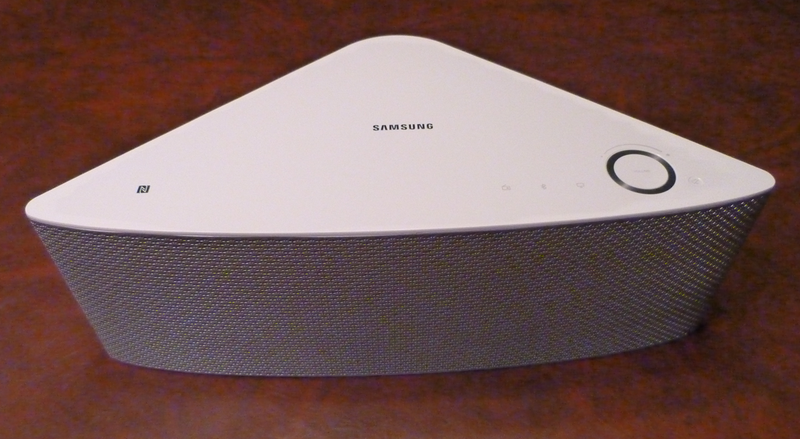 Bottom line: The Samsung Shape M7 is a very good self-contained speaker system that delivers more than a $399 Sonos Play:5. But if you’re looking for a critical-listening platform, you won’t find it in Samsung’s ecosystem. To be fair, I wouldn’t describe every Sonos component that way either. But pair a $349 Sonos Connect with something like a pair of $399 Audioengine A5+ powered speakers and you’re there (albeit at a price point 50 percent higher than $500). If you're looking for a big multi-room speaker, Samsung's Shape system is a viable alternative to what Sonos has on offer.